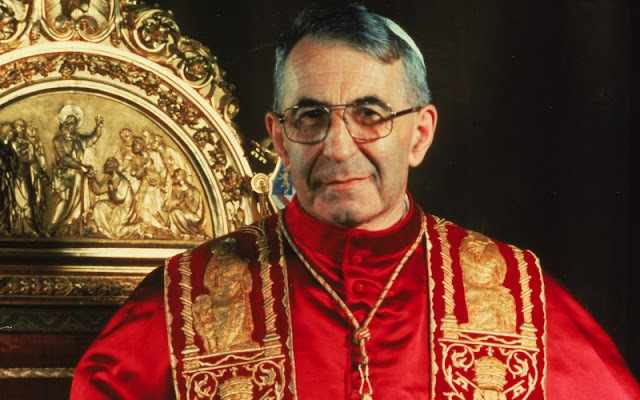 RADIO VATICAN REPORT: Pope John Paul I has moved a step closer to sainthood with the recognition of his heroic virtues. Pope Francis on Wednesday authorized the Congregation for the Causes of Saints to promulgate the decree approving his predecessor’s heroic virtues which confers on him the title ‘Venerable’. Born on 17th Oct 1912 at "Forno di Canale (Belluno, Italy), Albino Luciani was son of Giovanni Luciani and Bortola Tancon. He was baptized the same day at home, by the midwife, as he was in danger of death but formalized two days later in the Church by the curate. On 2nd Feb 1935 he was ordained deacon and on 7th July 1935 Ordained to the priesthood at St. Peter's Church of Belluno diocese of Belluno e Feltre. In February 1947 he Graduated from the Gregorian University in Rome with a doctorate in Sacred Theology, his thesis being, "The origin of the human soul according to Antonio Rosmini". 27th December 1958 he was Consecrated Bishop by John XXIII at St. Peter's Basilica together with the newly consecrated bishops, Gioacchino Muccin and Girolamo Bortignon. In 1977 he participated in the IV Ordinary General Assembly in Rome of the Synod of Bishops regarding "Catechetics in Our Time". August 10 the following year brought him again to the Vatican after the death of Pope Paul the VI. On 26th August during the second day of the conclave, he was elected Supreme Pontiff of the Roman Catholic Church and he chose his name John Paul I, wishing to serve the Church as his predecessors did. During his first Sunday Angelus he humbly acknowledged that he chose that name knowing that he neither had the wisdom of the heart of Pope John nor the preparation and culture of Pope Paul. With this name he became the first Pope to take up a dual name in papal history. Luciani vowed to serve as a teacher and a servant and had taken up Humilitas (Humility) as his episcopal motto which was evident even after he was appointed a pope. He wished to do away with Papal Coronation mass and chose to have just papal inauguration. He also preferred not to use the ‘sedia gestatoria’ or the ceremonial throne like an armchair on which the Pope travels from St Peter’s Square. Luciani a warm, gentle and kind man with a friendly disposition was loved by the people who were in awe of his persona. He had impressed people with his excellent oratory skills. His ideologies reflected the spirit of humanity and showcased the immense love and warmth that he had for God and his people. His swift six point plan defined what the journey of his pontificate would be. He planned to renew the Church through the policies implemented by Vatican II, to revise canon law, to remind the Church of its duty to preach the Gospel, to promote Church unity without watering down doctrine, to promote dialogue and to encourage world peace and social justice.